I received a belated Christmas gift from my friend, Anthony, when a package containing this interesting Chris Davis patch came in last week. 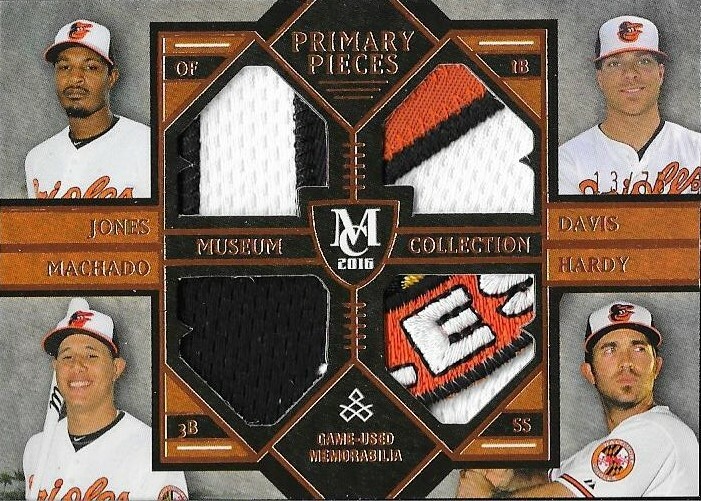 This is a Hits Memorabilia card from 2016 that has a pretty sweet patch. I saw some of their cards on Ebay recently (and I think this card was one of them), and wasn't sure what to make of them. Anthony included a note with the card saying he probably would never buy this product on his own, but since he saw the Davis patch, he got it for me. I've got to say, it is a pretty quality card. The patch is great, and the card looks professionally made. I visited their website, www.hitsmemorabilia.com and checked it out. It looks pretty decent. Maybe they are a new, up and coming card company? I'm not sure, but they aren't licensed by MLB or the MLBPA. Still, I really like the card, and appreciate Anthony picking it up for me. Anthony also added to my Miguel Gonzalez IP auto collection that Max started at Sox Fest in Chicago. Anthony was there, as well, and picked this up for me while Max was getting the other cards signed. Thank you so much for the Christmas gift, Anthony! I couldn't leave my guy, Nolan, out of my TTM obsession. 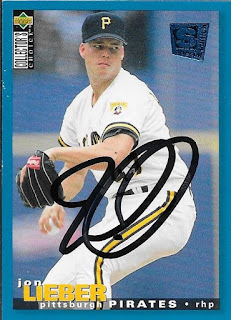 I really had to send him something to sign and add it to the album and roster of TTM successes, even though I have been sent signed cards from him before, When this Topps Now card of Nolan came out for July 24, I made sure to let his wife, Jenny, know that they were available. Unfortunately, she was busy that day and forgot to pick a few up. No problem, though, because I bought the package of five. I told her that I had ordered them and intended to send her one, and she said that if I sent an additional one, she would have Nolan sign it for me. So, I sent the two cards out at the beginning of August, only to find out that they were lost by USPS. I didn't realize they were lost until January, so I went on Ebay and bought two more and sent those out. 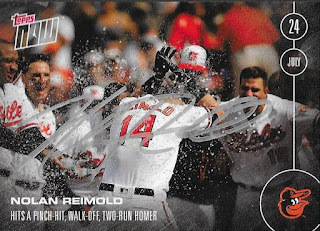 Thankfully, the second package got to the Reimold house safely, and Nolan sent me this one back signed in silver Sharpie. 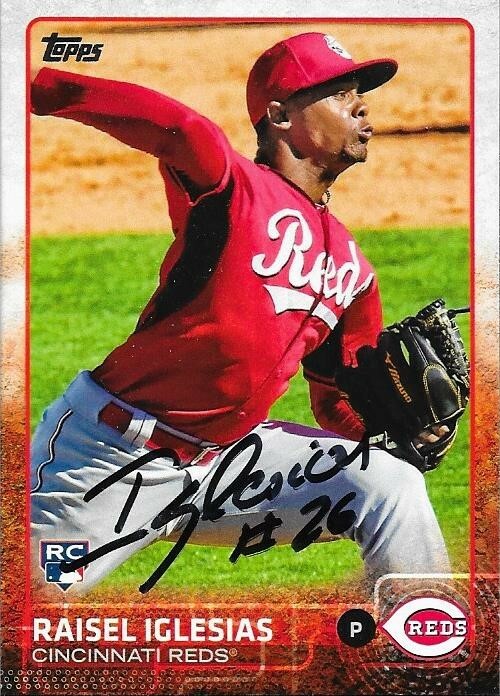 Now, this card can be placed among all of my other TTM and IP autos. Nolan isn't signed for this season, yet, but I believe he will be soon. He has a huge family, so he has a lot of commitments going on right now, anyway, but I'm sure he feels great and wants to continue his career. 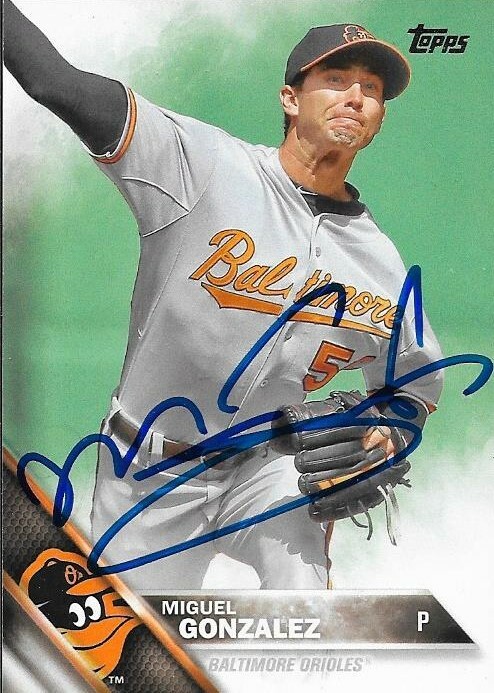 It is unfortunate that his Orioles career is likely over for now, but you never know, he could be back at some point. He is very popular in the Orioles organization, so maybe some day he will be a coach for them, if that is a path he wants to take. My hope is that is a long way away and that he gets a deal to play in the majors for 2017. Normally, for my TTM successes, I post a player's career stats, and for Nolan I will, but I fully expect the stats to be incomplete, as I believe he has several more years left in the tank. Go get em, Nolan!! Reimold (b. 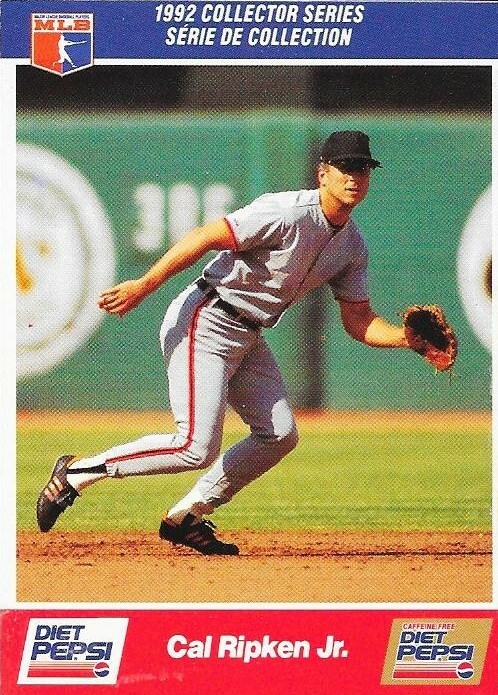 1983) has played in the majors since 2009 for the Orioles, Blue Jays and Diamondbacks. He has 339 hits, 56 home runs and a .246 batting average. His career was derailed when he broke a bone in his neck while diving into the stands to catch a ball in 2012. I've met Nolan on several occasions and he has always been awesome to me. Although, I probably creeped him out pretty badly by inviting him to dinner with my friend, Ryan and I when the Bowie Baysox were in Richmond playing the Flying Squirrels. I couldn't help it, I was pretty star struck and figured it would be a nice gesture. Ryan told me later that it probably came off as a bit creepy, and I have felt embarrassed ever since. We laugh about it now, though. I meant what I said, I would buy him dinner sometime. I met Nolan's wife, Jenny, through this blog because of a Bowie Baysox bobble head that I had picked up. I traded it to Jenny for a pair of batting gloves that Nolan had been wearing during the final game of the 2011 season, when the Curse of Andino struck the Red Sox. Ever since, I have corresponded with Jenny. She has hooked my son and I up with some amazing stuff, and I am forever grateful for her generosity. I hope Jenny knows how much I appreciate everything, even though I tell her thank you every chance that I get. I sent the second package to Jenny on January 25 and got the card back on February 2, for an 8-day TAT. Thanks again, Nolan and Jenny! The process in which I send a TTM out to a player takes some time to evolve, unless I buy cards specifically to send to someone. Meaning, unless I have bought some vintage cards that I have to send out to someone right away, it takes me a bit to finally get the motivation to send to a player. 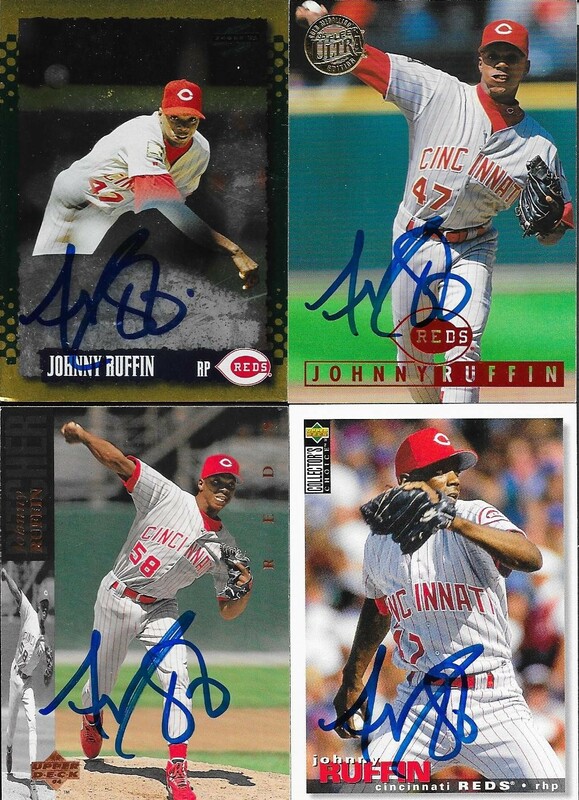 One of which is tonight's TTM success, Johnny Ruffin. Usually, I will start on a player when I find an interesting card at the card shop on in one of my boxes. Ruffin came about when I was sorting my extra 1995 Topps for my set. I took the extra cards from my box break of 1995s, sorted them in order, then I went through the checklist on sportscollectors.net and pulled everyone with a decently high success rate (60% +) or recent successes within 6 months or so. Then, I went through my boxes to see if I had anything of those players. I had a few cards of him, but most came from some box searching at my local card shop. The Gold Leaf Rookie at the top of the page and the above 1995 Ultra Gold Medallion came from the LCS. The 1995 Score Gold Rush and 1995 Collectors Choice came out of my boxes. The 1994 Upper Deck came from the box I busted with Chris a while back. I got all of these cards together, plus some extras and sent them out. I'll put Topps cards in the envelope first, then I will pick ones from interesting sets that I think will look nice in my binder. Finally, I will add in some sets that I feel may be under represented in the album. The remaining cards, if any, go in a "sent" row in my box, which will then be sent out to kids starting out on TTMs. 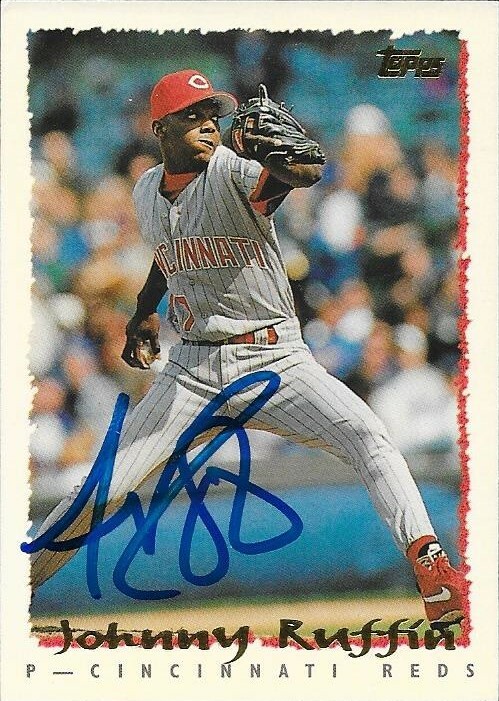 Ruffin (b.1971) played in the majors from 1993 to 1996, 2000 and 2001 for the Reds, Diamondbacks and Marlins. He had a career record of 10-6 with an ERA of 4.13 and 163 strike outs. 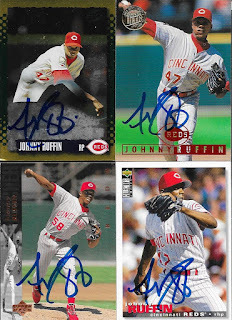 I mailed to Ruffin on January 24 and got the cards back on February 2, for a 9-day TAT. 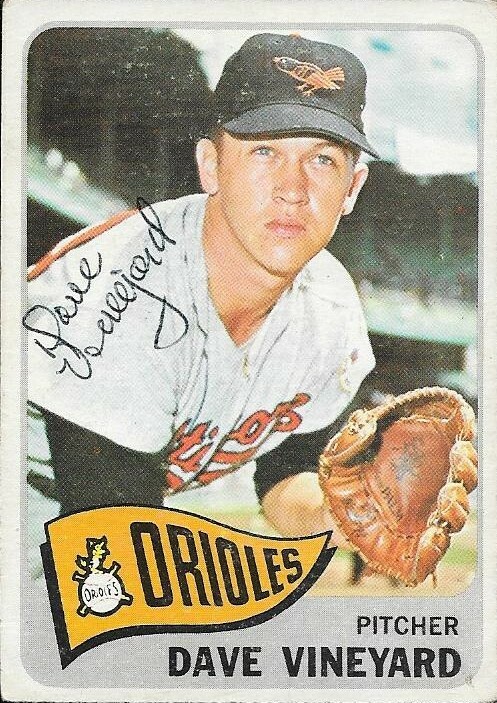 I don't know how long I had this 1965 Topps in my Orioles box, but a cursory look in the box revealed this card and I saw that Vineyard signed TTM. 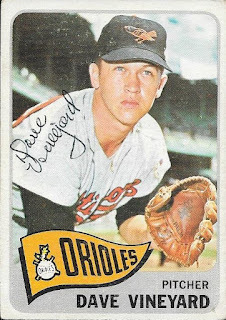 I'm always happy adding a new Oriole to the collection, and the 1965 set is one of the best. Vineyard (b. 1941) played for the Orioles in 1964. He had a record of 2-5 with a 4.17 ERA and 50 strike outs. I mailed to Vineyard on January 11 and got the card back on January 31, for a 20-day TAT. I got a nice package for Christmas as part of the blogger Secret Santa from Angus of "Dawg Day Cards." He hooked me up with some really cool Orioles rarities. In the box were O Pee Chee cards ranging as far back as 1970. That was really cool! 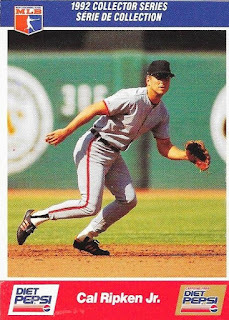 The above Cal Ripken was one of a few that I didn't have in my collection. These cards, you will see again! I plan on sending these out as TTMs very soon. I hope the players will sign the O Pee Chees as well as the regular Topps and not think I am trying to get extras of the same card. It's worth a shot, though! Thank you so much for the Christmas care package, Angus! 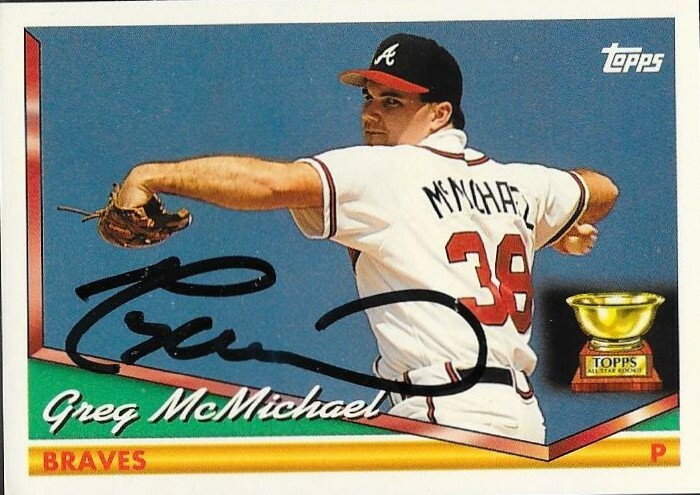 I added some nice mid-90s cards to my binder recently with this success from Greg McMichael. I especially liked this 1994 Topps, since it had the rookie cup and was a horizontal card. Here are the other cards that I got. There is a 1995 Topps Cyberstats, 1995 Topps base, 1994 Fleer Ultra and a 1995 Fleer Rookie Sensations. The Rookie Sensations looks really nice with the big Braves tomahawk. McMichael (b. 1966) played in the majors from 1993 to 2000 for the Braves, Mets, Dodgers and A's. He had a career record of 31-29 with an ERA of 3.25 and 459 strike outs. He finished second in the 1993 NL Rookie of the Year voting (to Mike Piazza). He won the World Series in 1995 with the Braves. I mailed to McMichael on November 22 and got the cards back on January 29, for a 68-day TAT. 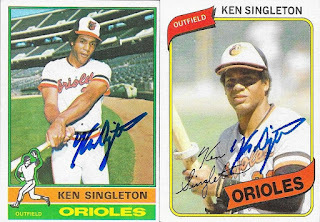 I was able to add another Oriole to my TTM success list recently when I got these signed cards back from Ken Singleton. 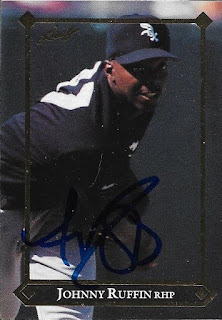 Along with the signed cards, I received a note from Singleton asking that in exchange for him signing my cards, would I make a contribution to the Cool Kids Campaign. I sent them a check last week, since he was nice enough to sign my cards. The above 1982 Fleer isn't the greatest of cards, but it will still be a nice fit in my album. I have a couple of cards signed from that set, and they turn out as nice as can be expected. These two were the ones I was really looking forward to getting back from Singleton. They are Drake's cards from 1981 and 1983 (left to right, respectively). Seemingly made by Topps, since the backs of the cards are virtually the same as a 1981 and 1983 Topps. They're pretty cool cards and I have no clue where I got them from. I just know they have been in my Orioles box for a long time. Finally, I had to include a couple Topps cards. They are 1976 and 1980. They are a few of the under-represented sets in my binder (80 especially, since I haven't really picked up much bulk of that set, yet). Singleton (b. 1947) played in the majors from 1970 to 1984 for the Mets, Expos and Orioles. He had 2,029 hits, 246 home runs and a .282 batting average. He was an All Star three times and finished as high as 2nd in the AL MVP voting (1979). He would receive MVP votes in 7 of his 15 seasons. 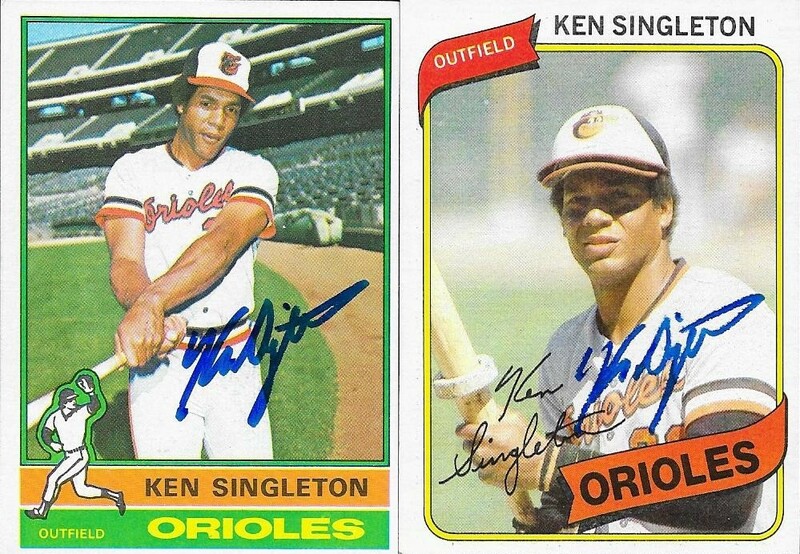 Singleton won the World Series with the Orioles in 1983. 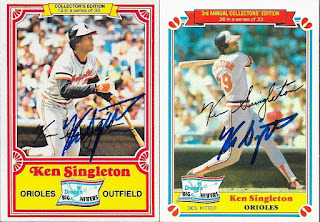 I mailed to Singleton on January 11 and got the cards back on January 29, for an 18-day TAT. I made a quick and easy deal with a guy named Ryan that I met earlier last summer while he was graphing with my buddy Steffan at Camden Yards. Ryan had some IP autos he wanted to sell real quick, and I figured I'd help him out. He sent me some nice cards, like the above Ben McDonald. I sent TTM to McDonald last year, but it still hasn't come back. I didn't have this one to send, so I'm glad to add it to the album. Here are the other guys that Ryan had. These will find a nice home in my album, along with my TTMs and other non certified autos. I appreciate the deal, Ryan! Thanks so much. 1961 Topps cards weren't the only ones I picked up from the antique shop in January. I also grabbed a few 1969 Topps for my set. I found out when I got home that I hadn't quite updated my needs list like I had thought. I had maybe three or four of the cards already. One of them was Al Spangler. No worries, though, I saw that he signed TTM, so I sent my extra 69 along. After a look through some boxes, I saw that I had this 1961 Topps buyback and a 1968 as well, so those went too. I'm really not the biggest fan of how Topps does their buybacks. I don't care for the foil stamps on the cards. I see the point that some folks need them to be pointed out to them, but if I were building a set, I wouldn't include a buyback with a stamp. I also don't include them among my Topps Autograph Project. Still, they're pretty cool, and they give me ideas of guys to look up at times. All of that being said, this 2015 buyback of a 1961 Topps turned out really nice, I think. The 1968 was in my vintage box. I had maybe a third of the set in my box at one point, but have robbed from it to send TTMs. I don't think I have put myself to far behind on that one if I ever get around to starting the set. Most of the guys I have pulled from it are non-stars. I still need to finish the 69 set sometime soon. I'll get there. 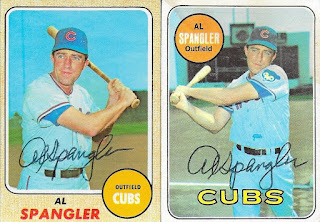 Spangler (b.1933) played in the majors from 1959 to 1971 for the Braves (Milwaukee), Colt .45s/Astros, Angels and Cubs. He had 594 hits, 21 home runs and a .262 batting average. 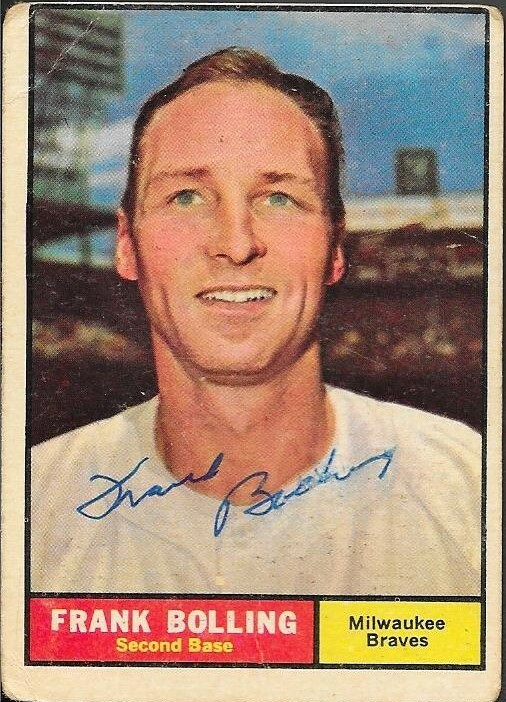 He was the 8th pick in the premium phase of the 1961 Expansion Draft (picked up by the Colt .45s). 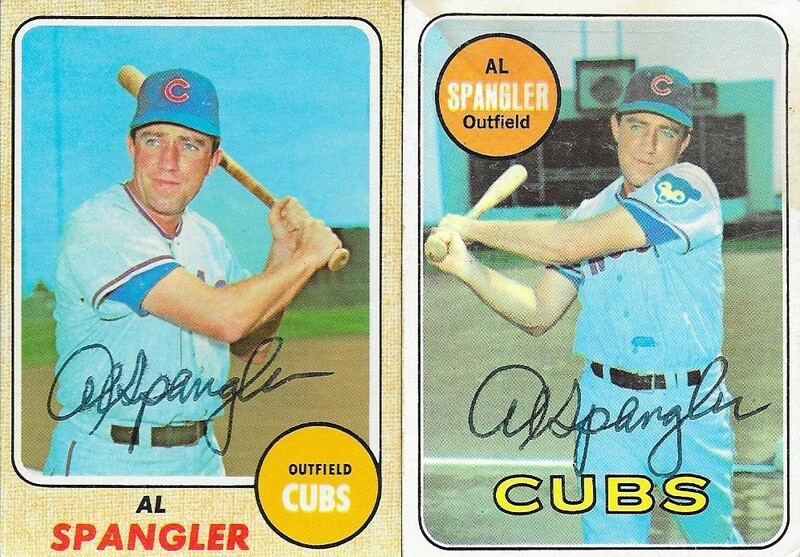 I mailed to Spangler on January 17 and got the cards back on January 29, for a 12-day TAT. I was able to get some nice 90s cards back from Jon Lieber not too long ago. The above 1995 Collector's Choice SE turned out much better than I had expected. This was a product that I got a ton of when I was growing up. This card probably is a holdover from that era in my collection, most likely. I had so many of these cards, but unfortunately, lots of them were destroyed due to sticking together from the over-gloss. Thankfully, this one will live on in my autograph binder. 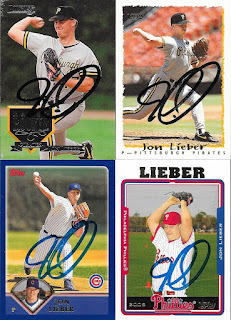 Here is an assortment of other cards I got from Lieber. The top left 1995 Donruss looked really nice. That was a set that I completed a while back, long after I started collating it in 1995. I didn't love the set more than any other at the time, I just opened a ton of it and thought it would be cool to assemble the set. The rest of the above cards are some Topps versions. 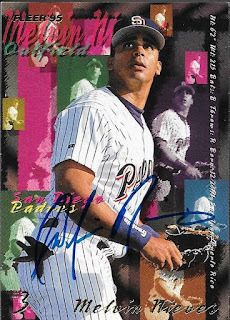 The blue 2003 Topps is one of only 4 2003s that I have been able to get signed so far. I'm leaning toward buying an early 2000s box of Topps and 2003 is on the short list of cards I may pick up. Finally, here is a card that was victim of the "sticking together" of the overglossed 90s cards. I was able to pretty much salvage it, but it did take a hit. I had to include it in the mailing, though, mainly because of the gold foil, but also because there are a few fellow bloggers who love "pitchers at bat". 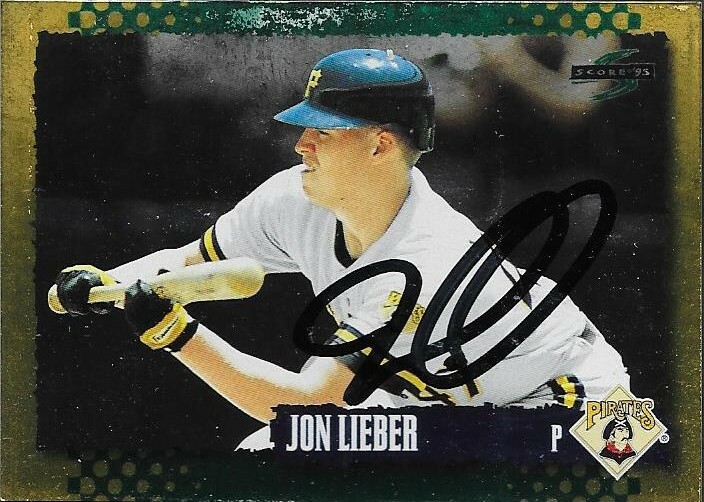 Lieber (b.1970) played in the majors from 1994 to 2002 and 204 to 2008 for the Pirates, Cubs, Yankees and Phillies. He had a career record of 131-124 with 1,553 strike outs and an ERA of 4.27. He had his best season in 2001 when he was 20-6 with a 3.80 ERA for the Cubs. That season, he finished 4th inthe Cy Young voting and received his only All Star nod. I mailed to Lieber on January 11 and got the cards back on January 28, for a 17-day TAT. 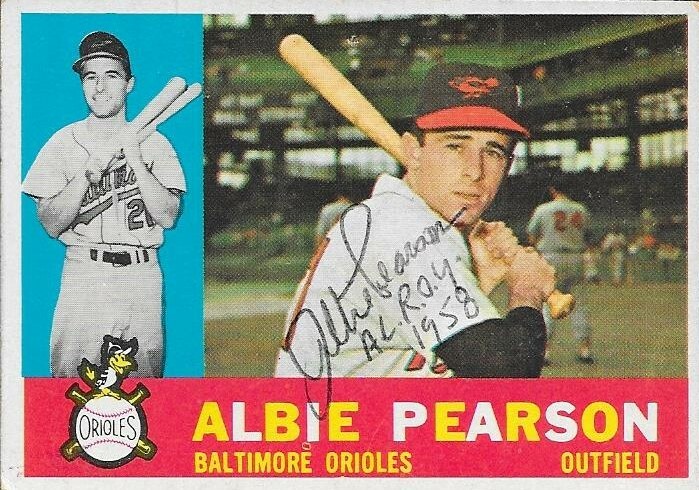 I was able to get an Oriole on a 1960 Topps with this success from Albie Pearson. I wasn't expecting the awesome inscriptions on all of the cards, so that was a nice bonus. I still haven't gotten many 1960 cards signed, so when I found this card in my vintage box, I put it in the mailer with the two cards below that I picked up in Columbia. This was part of the 1961 Topps purchase at the Columbia antique shop last month. Pearson charges $5/card, so I definitely got my money's worth out of this TTM success. Pearson (b. 1934) played in the majors from 1958 to 1966 for the Senators, Orioles and Angels. He had 831 hits, 28 home runs and a .270 batting average. He was the 1958 AL Rookie of the Year and was an All Star in 1963. That season, he appeared on his only MVP ballot, finishing 14th. He was obtained by the Orioles in 1959 in a trade when the Orioles sent Lenny Green to the Senators. He was the fourth overall pick in the 1960 premium expansion draft for the newly created Angels. 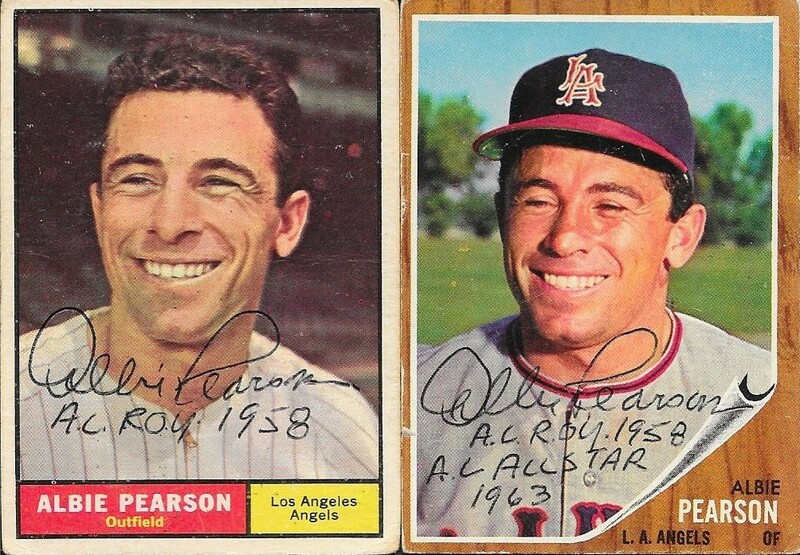 I mailed to Pearson on January 16 and got the cards back on January 27, for an 11-day TAT. I got two packages in recently from my good friend, Dugan. 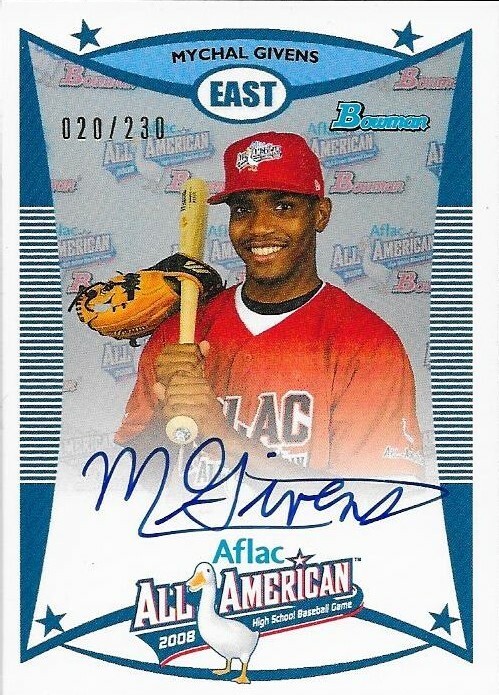 One was this Mychal Givens Aflac All American autograph that is numbered 20/230. Givens has really emerged as an effective reliever in the majors. This is after he was drafted as a shortstop. He may get some opportunities to close games here and there to spell Zach Britton. 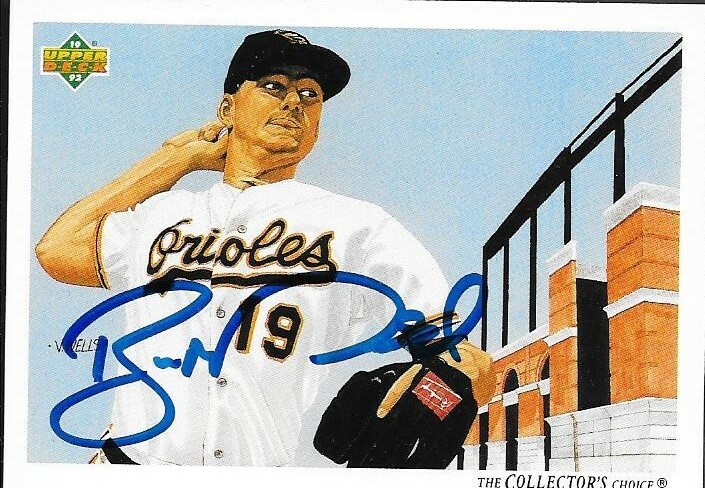 Along with Britton, Givens, Darren O'Day and Brad Brach make a really dominant bullpen. Dugan picked up this TJ McFarland card for me well before Christmas. He knew I loved the Orioles and also used to go to Kinston Indians games, so he thought I would like this card. He was right! McFarland was just designated for assignment to make room for newly acquired Craig Gentry on the 40-man roster. If he clears waivers, he will be invited back to Spring Training and could likely start the year at AAA Norfolk. Thanks so much for the packages, Dugan! Here we have another player who floated around my "to be TTMed" box for a long time before I finally got around to mailing. 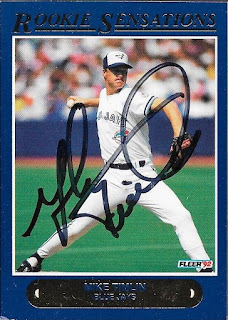 I actually sent three cards of Mike Timlin out for signature, but he only signed two of them. 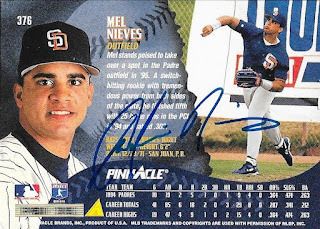 The one card he didn't sign was a 1998 Score, but that's ok, it'll go in my "extras" pile that gets sorted, then mailed out to kids as TTM Starter Packs. I figure that's a good way to recycle some cards once I have a success back; send them out to kids to help them since they may not have many of those years of cards. 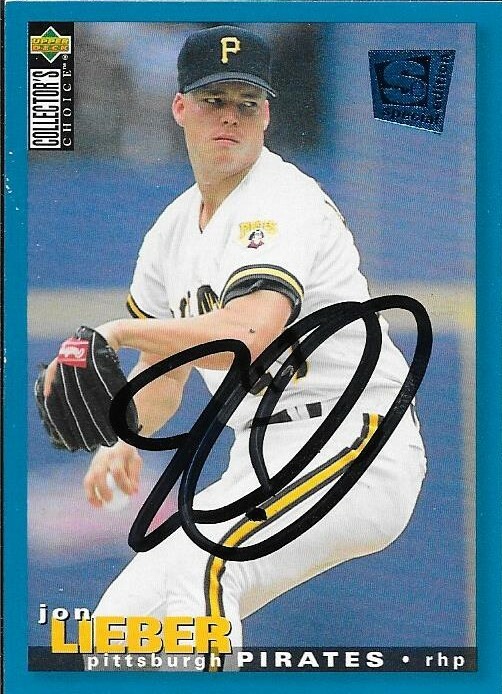 I was glad Timlin chose to sign this 1992 Fleer Rookie Sensations card. This was picked up at my LCS, and I thought it would look nice in my album. I always enjoy getting "different" cards signed. Timlin (b. 1966) played in the majors from 1991 to 2008 for the Blue Jays, Mariners, Orioles, Cardinals, Phillies and Red Sox. He had a career record of 75-73 with 872 strike outs and an ERA of 3.63. He also had 141 career saves. 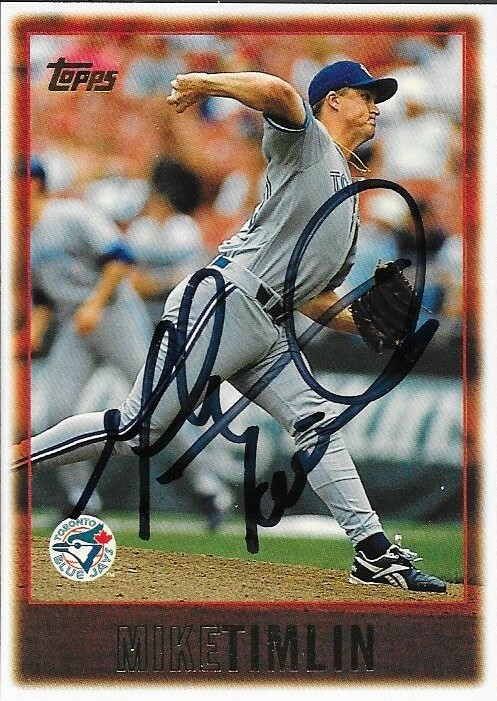 Timlin won the World Series twice with the Blue Jays (1992 and 1993) and twice with the Red Sox (2004 and 2007). I mailed to Timlin on January 11 and got the cards back signed on January 27, for a 16-day TAT. I was able to get a few really cool cards signed recently from former second baseman, Carlos Garcia. This 1995 Score turned out really nice, I think. I always liked this set, and at one point, tried to complete it. This is one of those over-glossed sets, though, that tend to stick together. I wish there was a way to fix this problem, but I don't think this exists. I also added these three 90s cards. I always enjoy the 1991 Fleer set. The bright yellow of the set is very different than most sets out there, still. Some folks don't like it, but I always have. Of course, I like the 1990 Donruss set as well. 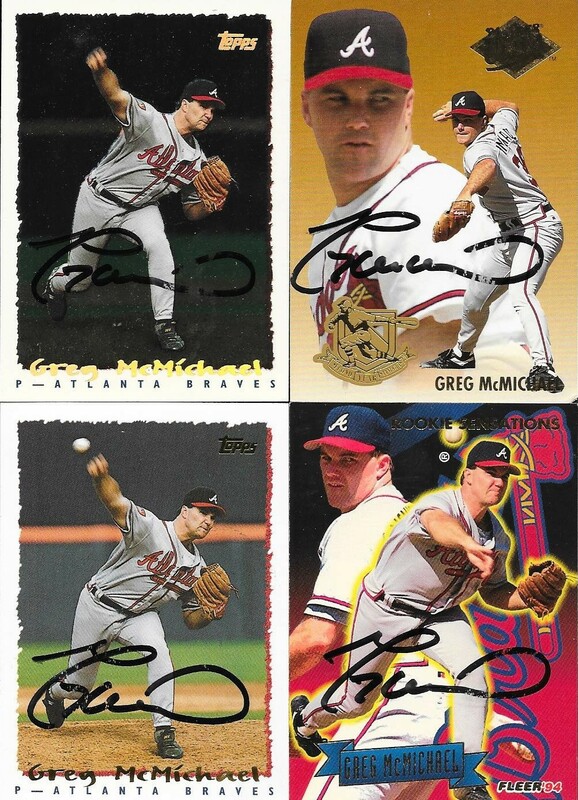 The middle card is a 1996 Fleer, which was made with autograph hunters in mind. The rough finish makes it a pain to leaf through the cards, but they really look cool signed. Finally, the card on the right is a 1997 Donruss. I don't recall opening any packs of this when it came out. The only versions I have are from bulk card finds and purchases. Still, the design is nice, and the signed card looks good. Garcia (b. 1967) played in the majors from 1990 to 1999 for the Pirates, Blue Jays, Angels and Padres. He had 580 hits, 33 home runs and a .266 batting average. 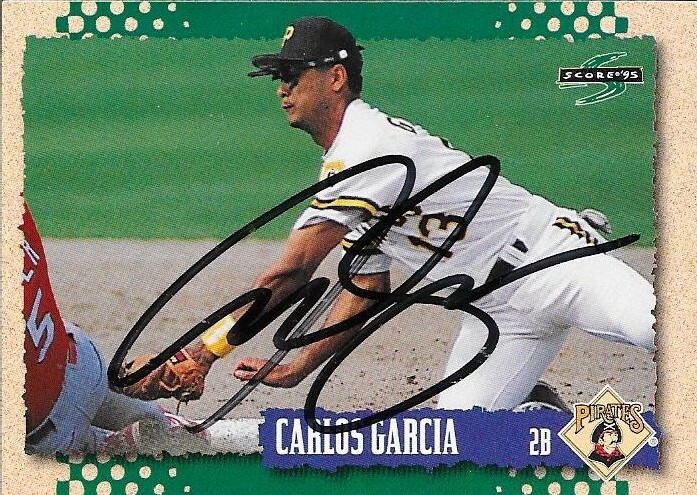 He was an All Star in 1994 while with the Pirates. I mailed to Garcia on November 7 and got the cards back on January 26, for an 80-day TAT. I didn't really make many purchases for the PC at the most recent card show I attended. The show was on February 11 and I went mostly to pick up some bulk Topps cards for more TTMs, but I did find this quad relic Orioles card that I thought would go nicely in my Davis PC. The seller wanted WAY too much for the card, but as I was about to leave at closing time, I made him a reasonable offer, and he accepted. 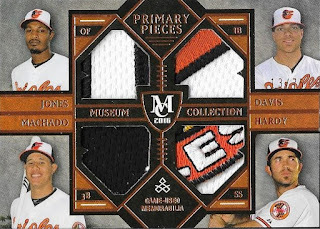 Yeah, the patches are great, but there's no way I would pay the sticker price he had on the card ($100). No way at all. Luckily, I got it for a LOT less than that. I also got it for exactly what I had left in my wallet, which worked out nicely. I had a great time at the show, Chris came with me and actually helped me this time. He didn't get too bored, and actually picked up a few things for himself. 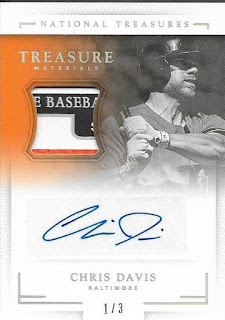 One of which was a really sweet Matt Cain patch card for an absolute steal. He may have done better than I did! A day after my Ray Rippelmeyer success came in, I got another of the guys I found at the antique shop back. 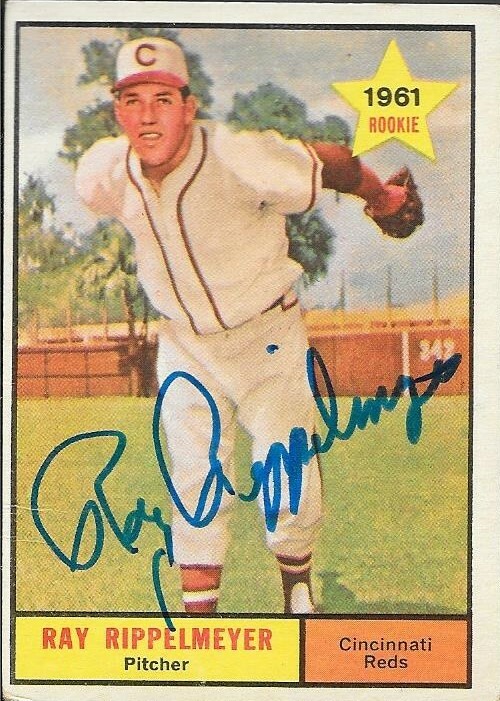 This 1961 Topps Franks Bolling doesn't look as painted as the Rippelmeyer does, but it is still a nice card. I had picked up a '62 Bolling at the shop and had the 1965 in my vintage box at the house. That made for a nice little package to send out and see what happened. Bolling has a very modest signature, but you can see it, so that's all that matters. Bolling (b. 1931) played in the majors from 1954 and 1956 to 1966 for the Tigers and Braves (Milwaukee and Atlanta). He had 1,415 hits, 106 home runs and a .254 batting average. He was an All Star in 1961 and 1962 and won the Gold Glove Award in 1958. He finished his highest in the MVP voting in 1958 when he finished 16th in the AL voting. 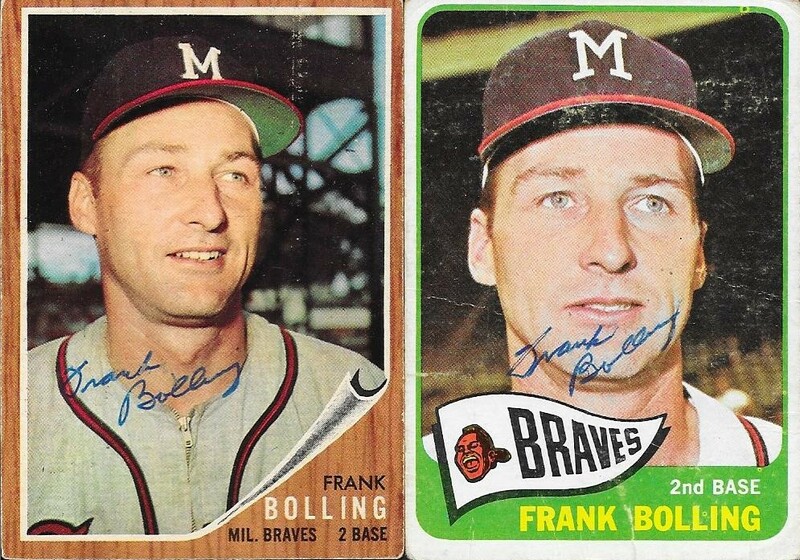 I mailed to Bolling on January 17 and got the cards back on January 26, for a 9-day TAT. Last month, I took my final trip to the antique shop in Columbia, SC. Conrad has finally retired and is closing up shop for good. I made sure to stop by to see him before he closed, and I had to pick up something since I was there. I picked up a bunch of bulk cards, a signed baseball (which, surprisingly, I haven't posted yet) and several 1961 and 1962 Topps cards for TTM purposes. 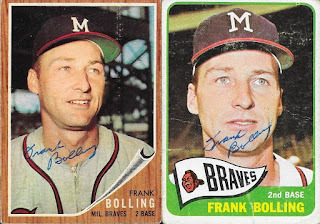 I bought those because at the time, I had only one signed 1961 Topps. So, I figured I would beef up that portion of my ledger, and some of the cards I picked up really looked great. 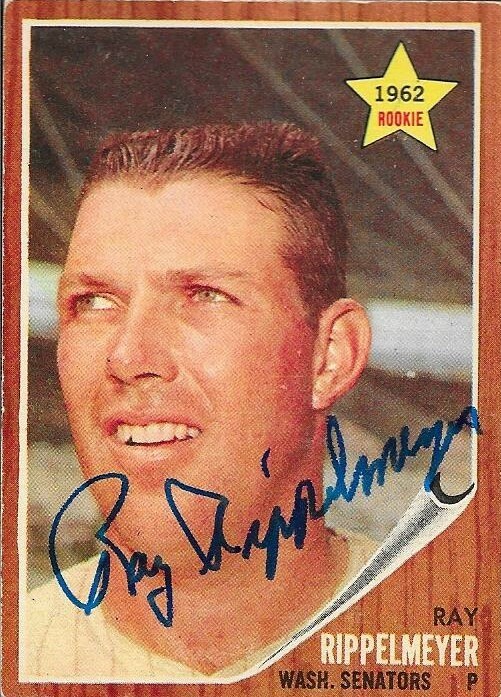 The first of the cards to come back was this success from Ray Rippelmeyer. 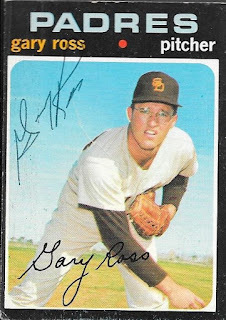 The above 1961 Topps is his rookie card, and I really enjoyed how his uniform looked on this card. It looks almost like an early 50s Topps in that he appears to be a painting, as opposed to a photo. 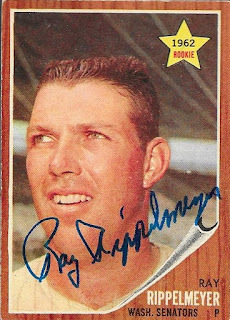 I went through a box of 1961 Topps at the shop and picked out several folks who signed TTM, according to Sportscollectors.net. After I got my subjects from that box, one of Conrad's helpers searched a few other boxes in order to help me find some other cards to send off of those guys. 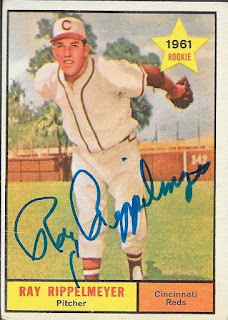 He found this 1962 Topps Rippelmeyer for me, and I'm glad he did. 1962 Topps looks great, and that was another set that was not well represented in my binder. Little did I know, I had another Rippelmeyer card at the house. This 1990 CMC was in the box that Mom had found in her attic and gave to me right before I went to Columbia. 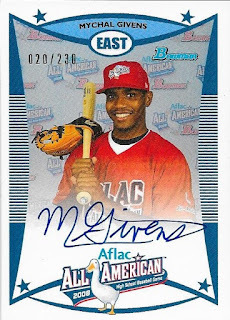 I was able to put another of these minor league cards to good use, which I was happy to do. Rippelmeyer (b. 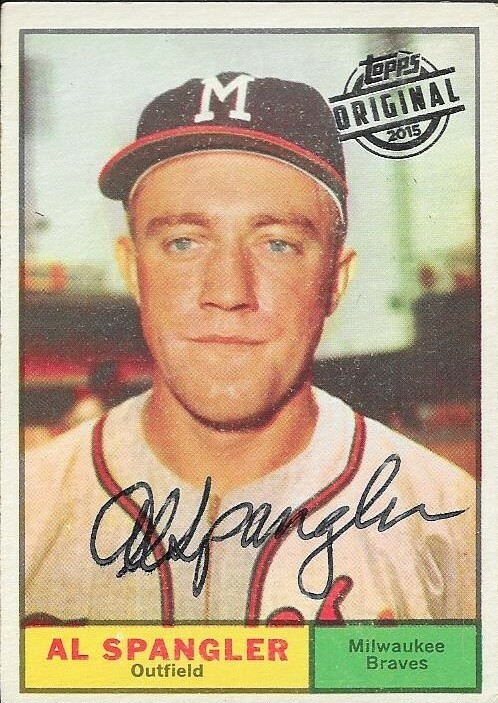 1933) played in the majors for 18 games in 1962 for the Senators. He had a record of 1-2 with 17 strike outs and a 5.49 ERA. While his card from 1961 lists him as being on the Reds, he never made the majors with them. He was picked up by the Senators in November 1961 in the Rule V Draft. I mailed to Rippelmeyer on January 16 and got the cards back on January 25, for a 9-day TAT. 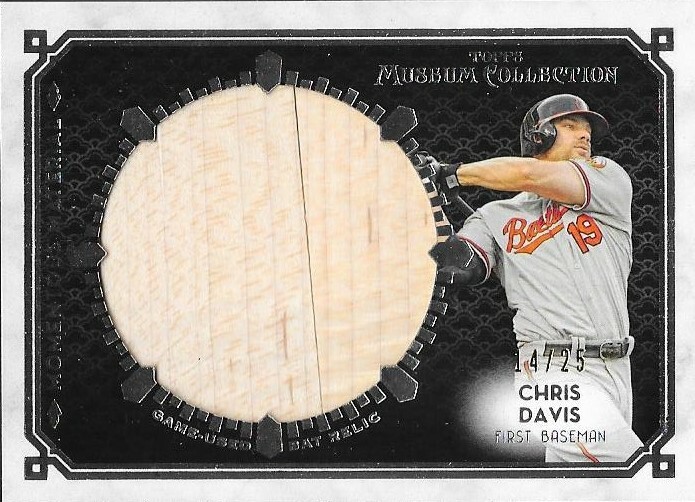 I was approached on Instagram by a kid named Keegan who had this 2014 Museum Collection Chris Davis jumbo relic. I had picked up a signed Andrew McCutchen 8 x 10 from my friend, Max, and Keegan is a huge McCutchen fan, so it was an easy match. I already had one of these Davis relics, but I figured it wouldn't hurt to add another, so here it is. It is numbered 14/25. To made the trade more balanced, Keegan included this Clayton Kershaw relic from 2014 Topps Tribute. 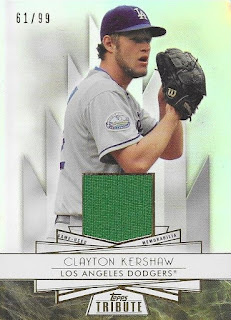 I didn't have any Kershaw relics and I liked the green relic, so I had him add this card, which was among the list of cards he offered. This is 61/99. Finally, Keegan let me pick up one of his IP autos to complete the deal. He got the better end of the deal, with me sending the McCutchen photo and a Job Pedersen die cut National Exclusive Allen & Ginter card. Still, he is happy with the deal, and so am I! 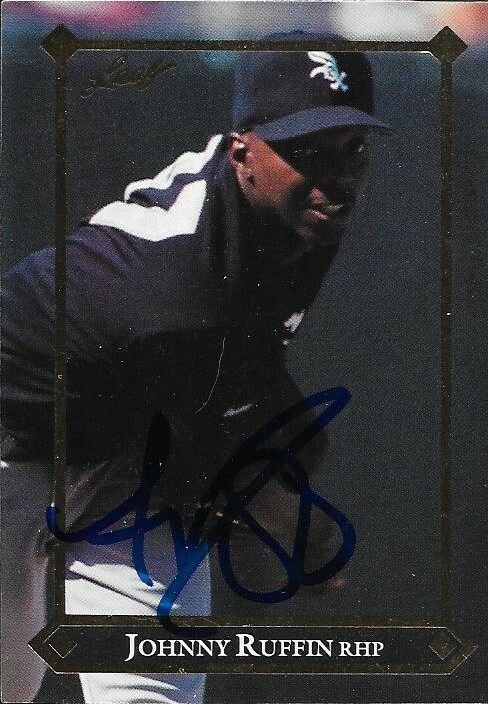 TTM Success - Tim Raines, Jr. 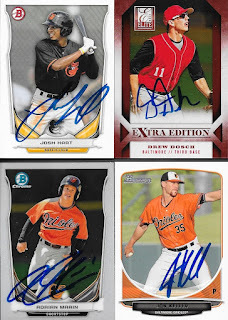 I had been going through my Orioles box, trying to find a few TTM subjects when I saw that Tim Raines, Jr. was signing. 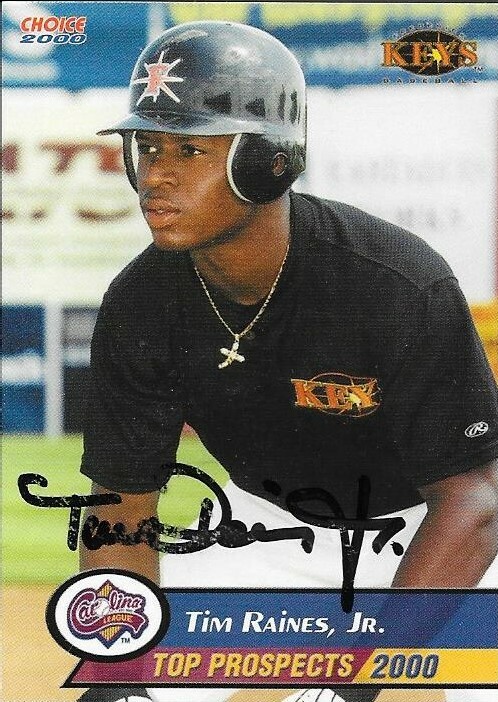 I went through the two boxes I had and found only one card of his, this Choice 2000 card when he was with the Frederick Keys. 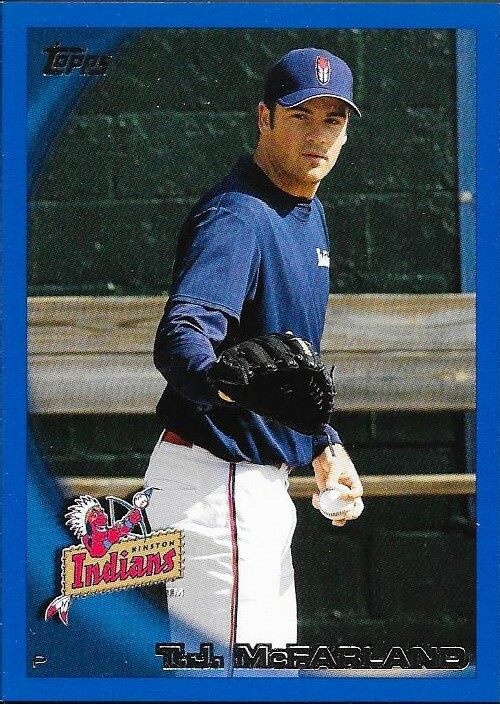 I didn't have many Minor League cards in my album, so this was a nice one to add. Raines (b. 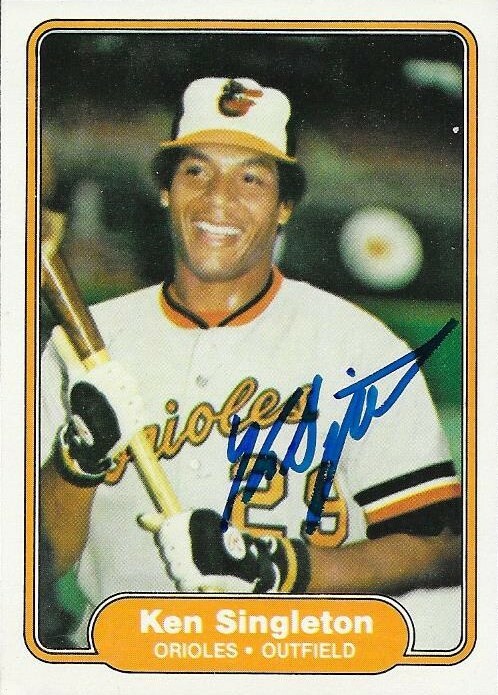 1979) played in the majors in 2001, 2003 and 2004 for the Orioles. He had 34 hits, no home runs and a .213 batting average. He became part of the second father/son tandem to play for the same team when his father, Tim, Sr. played for the Orioles on October 4, 2001. I mailed to Raines on January 4 and got the card back on January 23, for a 19-day TAT. I got a nice deal on another Chris Davis laundry tag relic recently when I picked this up off of Ebay. It was originally listed for $89.99, but when the seller reduced the price, I jumped all over it. I like Panini National Treasures. I now have several Chris Davis laundry tag cards, and am always on the lookout for more. Panini really does well with relic and patch cards. It doesn't make too much of a difference to me that the O's logo isn't on the card. This fits more into a player collection, anyway. 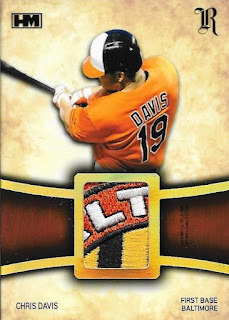 I plan on finding some more nice Davis patch cards, so the PC will keep growing. I feel like I have a pretty decent Davis collection. 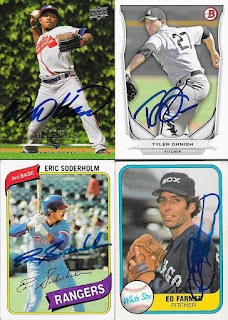 My buddy Max recently went to the annual Fan Fest for the Chicago White Sox and picked up a bunch of autos for me. We were operating under our normal agreement: I would search for cards that Max needed (mostly past players who would be there) and he would send me a few cards back signed for my trouble. Max nailed it, as usual with a nice return from quite a few players. 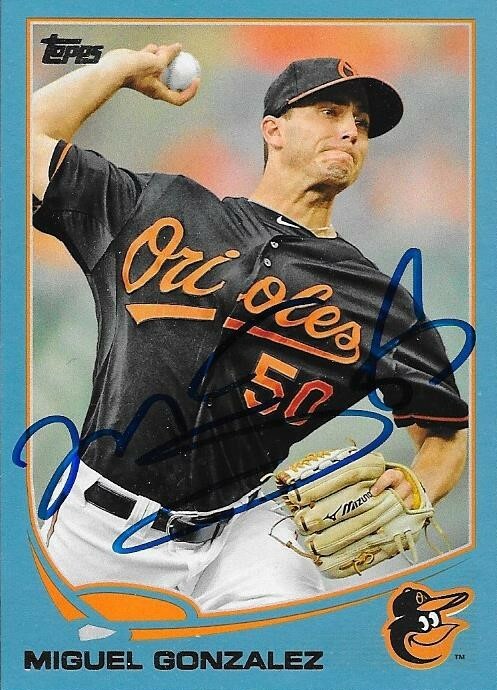 I was really glad to see these Miguel Gonzalez cards come back. The 2013 Topps Wal Mart blue at the top would have been fine by itself, but Max went for a mini rainbow here with the 2014 cards. There are red hot foil, Target red and Wal Mart blue cards from 2014. I thought this was a really cool touch from Max that he didn't have to do. I sent him a ton of Miggy cards, though, so he had a lot to choose from. Here are some of the other guys that Max was able to get. I know I sent him the Willie Harris 2008 Upper Deck. I may have also sent him the 2014 Bowman Tyler Danish. I know I failed to find him extra Eric Soderholm cards, since I had gotten him TTM and sent out my extras to a few kids as TTM starter packs. I also don't think I sent him the 81 Fleer Ed Farmer. Still, I'm glad to add these cards to my album. Max also used this opportunity to close a few minor deals. 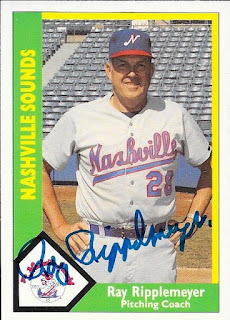 He sent me a 2009 Topps card signed by Skip Schumacher in exchange for a 2009 Topps Geovany Soto that I had. I went ahead and swapped those out in my album, so I didn't have the Schumacher to show. 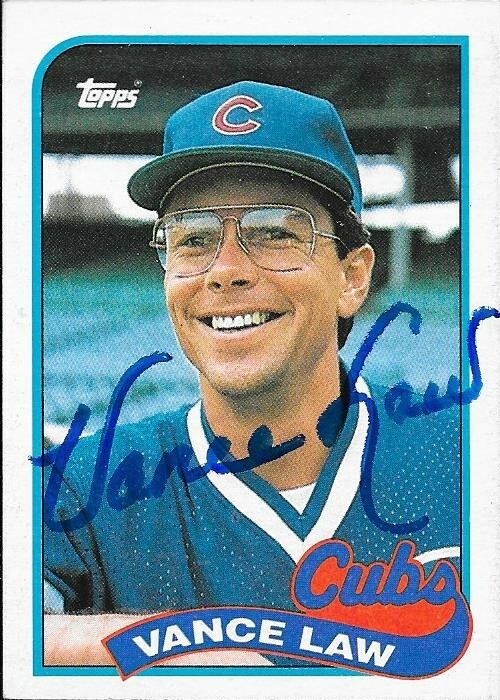 I also sent him a 1988 Topps Traded Vance Law that I recently got TTM for this 1989 Topps. Since the 88 Traded wasn't a true Topps base, I was completely fine with swapping it out for the 89. 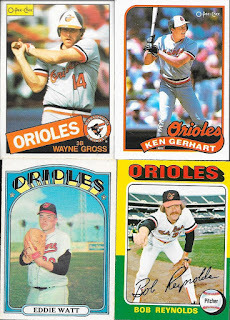 Max also included a few Orioles cards. 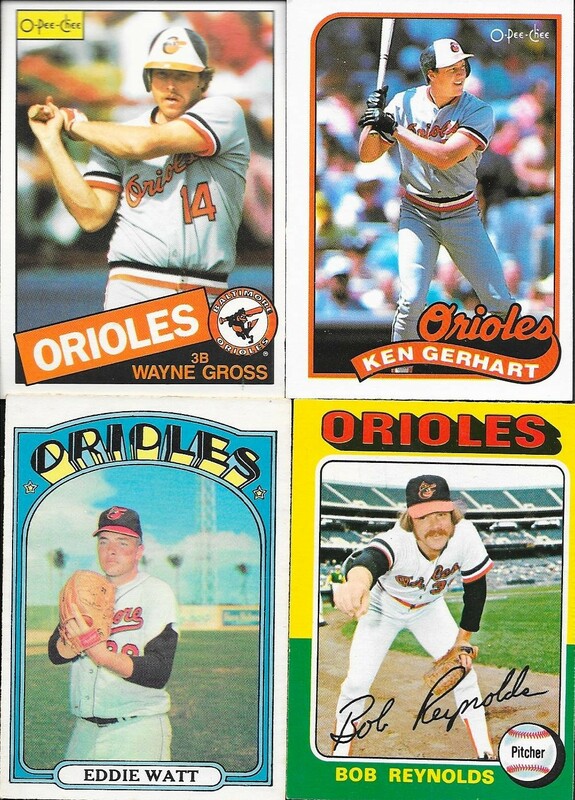 Most notably, Mas filled a team bag full of 1981 Fleer Orioles. There are a few duplicates in the bag, so a few may be sent out as TTMs shortly. 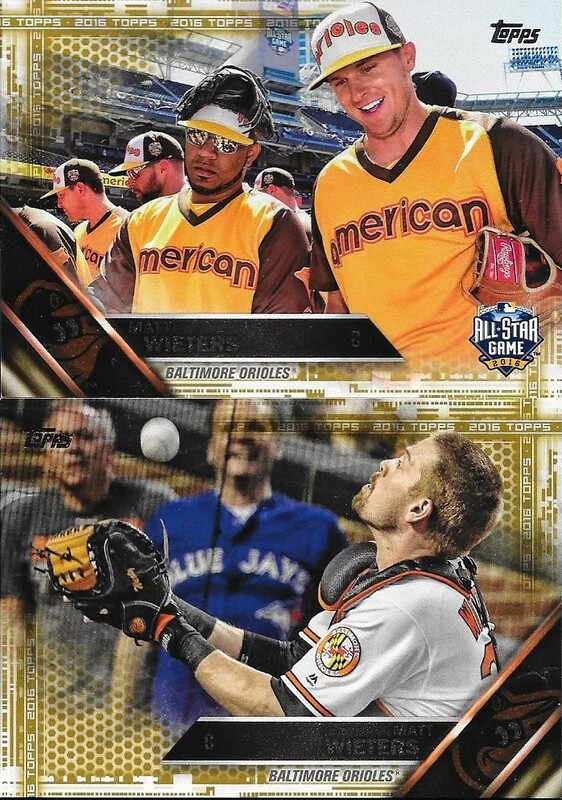 He also included these two 2016 Topps Update Matt Wieters cards. Funny how his appearance changed so dramatically between the two cards (spoiler alert, that isn't Wieters in the top card). So, thank you so much, as always, Max! I loved the package! Here is another player from the 90s that I was able to have sign several cards, Melvin Nieves. This 1995 Fleer turned out really nice. This set might be one of the freakiest sets there was. I think there was a gas leak in the Fleer building, and that is how the design for this set came about. Still, it lends itself well to being signed. 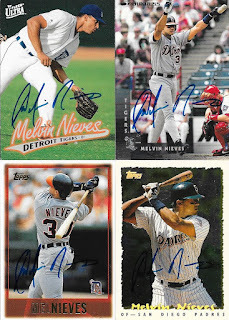 I had a lot to choose from for Nieves, and narrowed it down to six cards. They all look pretty good, I think. 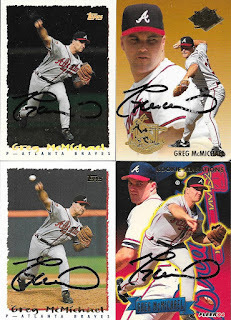 I believe the 1997 Fleer Ultra set looks really good when signed. The 1995 Topps Cyberstats don't turn out as well as I had hoped, but they don't look bad. Finally, here is a 1995 Pinnacle that at first glance looked like it came back unsigned. As I was putting it back in my box, I noticed the signature on the back of the card. Ok, cool! I'll take it! Nieves (b. 1971) played in the majors from 1992 to 1998 for the Braves, Padres, Tigers and Reds. He had 284 hits, 63 home runs and a .231 batting average. I mailed to Nieves on October 25 ad got the cards back on January 23, for a 90-day TAT. Here are a couple early 70s cards I will be adding to my autograph album (I'm on my fourth album now) that I got from former pitcher, Gary Ross. His signature doesn't really jump out at you, but still, I am happy to have these added to my collection. I have slowed down on early 70s cards, mainly because I haven't been by my LCS to pick up anything new lately. I plan on going by there soon to grab a whole new batch of stuff to send off, but I have been really busy lately, and haven't had the chance. 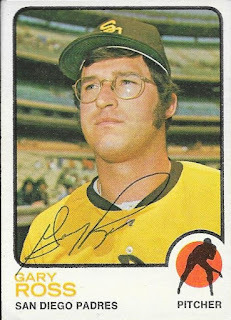 Of any card year, I think 1973 might be one that I really haven't been able to find decent bulk card of. I may have to find a box of them somewhere and use those, but I haven't really been looking all that hard. I do plan on adding some more early 70s bulk cards, I just need to get serious about it and buy some up. Ross (b. 1947) played in the majors from 1968 to 1977 for the Cubs, Padres and Angels. He had a career record of 25-47 with 378 strike outs and an ERA of 3.92. I mailed to Ross on November 18 and got the cards back on January 21, for a 64-day TAT. Care Package From Nick H.